One of the BEST parts about being a wedding photographer is seeing how every couple personalizes their day. With the rise of DIY weddings and handmade decor, your options are essentially only limited by your time and creativity, and you can put a personal touch on even the smallest of details. I always tell my couples that they don’t have to worry about “rules” when it comes to wedding planning. Every single detail can be personalized, and you should think of your wedding as a reflection of who you are as a couple. Have fun, get creative, and design a wedding that makes YOU happy. 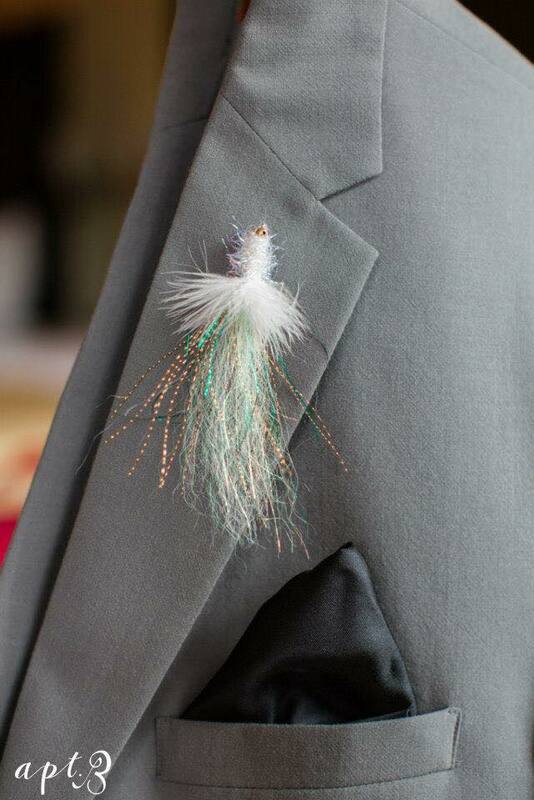 The groom's boutonnière is a traditional wedding day detail that has limitless possibilities for creativity. I love how Amanda and Mark infused their personalities and interests throughout their wedding day, but a fishing lure boutonniere?? That’s brilliant! Mark loves to fish, and he also taught Amanda how to tie lures so that she would have another great example of working with her hands to put on her dental school application. (And hey, she is currently rocking it out in dental school—yay!) So, they combined their interests and skills and worked together to make a lure in their wedding colors. It added such a sweet, personal touch to their wedding day!